While Ryan Blaney can now be scratched off the list, Erik Jones is still searching for his first career NASCAR Cup win. 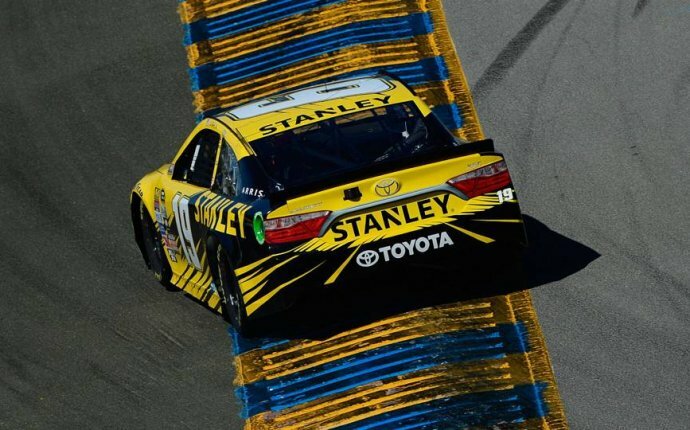 And judging by Sunday’s Pocono 400 and his Cup career- and season-best third-place finish, Jones could potentially be the next to follow Blaney as a first-time winner in NASCAR’s premier series. Neither were the Wood Brothers. Yet, there they were celebrating Sunday at Pocono Raceway after a momentous win for a storied organization and a storied family. The Wood Brothers trace their history to NASCAR’s early days when the only Petty racing was Lee (Richard’s dad) and the fastest siblings were the Flocks. The Woods later dominated with David Pearson driving the No. 21 Ford. “Our dad and uncles back in the ’60s and ’70s, they were almost unbeatable and built those wins up, ’’ co-owner Len Wood said. The Woods’ success faded. There were special moments, such as Dale Jarrett’s first Cup win in 1991, Morgan Shepherd’s last win in 1993 and Elliott Sadler’s first Cup victory in 2001, but there were struggles between those special days. The family’s darkest period was from 2008-10. The team failed to qualify for the 2008 Daytona 500, marking the first time since 1962 the “Great American Race” was held without the Woods. They missed four of the first five races in 2008. The family business teetered. It seemed as if Wood Brothers Racing would follow the fate of so many mom-and-pop businesses that were gobbled up by bigger competitors. Just these competitors weren’t Wal-Mart but Hendrick Motorsports and Joe Gibbs Racing. After Petty Enterprises closed its shop at the end of 2008, the question became if the Wood Brothers would do the same. With Ford’s support, the team survived, running select races. It wasn’t even half a season but it kept the family business alive. “You just take it one day at a time and one situation at a time and one crisis at a time, ’’ co-owner Eddie Wood said of the struggles. “There’s always something going on or changing in racing, and you just have to adapt and figure out a way to make it work. The team provided a feel-good moment in 2011 when Trevor Bayne won the Daytona 500 but the Woods hadn’t won since. It seemed only a matter of time, though, with the team’s affiliation with Team Penske and 23-year-old driver Ryan Blaney. While some might recall Blaney as the son of driver Dave Blaney, Ryan Blaney is actually a third-generation racer. His late grandfather, Lou, raced as early as 1958 and amassed more than 600 wins, driving sprint cars and modifieds. Dave Blaney was inducted into the National Sprint Car Hall of Fame in 2014, joining Lou, who was inducted in 2013. Dave Blaney didn’t enjoy the success in NASCAR he did in sprint cars, winning one Xfintiy race, but the family’s racing gene was passed on to Ryan. It was on a trip to watch his dad race in NASCAR when Ryan’s career began. He raced a quarter midget at age 8, making his debut at a dirt track not far from Pocono Raceway. As Ryan Blaney’s success grew, he moved through the ranks and began gaining attention of Cup drivers. The youngster held off the 2014 Cup champion Sunday by not making any mistakes. Harvick never got to the rear bumper of Blaney’s car to make a move. With that, Blaney became the 18th different driver to win for the Wood Brothers. Blaney joined the family in 2015 and their time together was expected to be short. “It was actually kind of understood that he was going to be moving on probably the next year, and then it didn’t happen, ’’ Eddie Wood said. Instead, Blaney is with the Wood Brothers, merging future with past. In a serendipitous nod to when the Wood Brothers were among the dominant teams, Blaney’s radio malfunctioned and his crew couldn’t hear him. They had to resort to the hand signals used back when David Pearson drove the No. 21 for them. Hand to the roof meant the car was loose, hand on the door meant the car was tight. @melonoptics Hey dudes! Who do we speak to about setting up a trade account? We're just starting our race team and would love to use Melon.